Lisa Van Heukelom earned her Bachelors of Science in Social Work and her Masters in Occupational Therapy from the University of Mary. Lisa has experience working in acute care, in-patient rehab, pediatrics and several years working with at- risk youth; all making her a great fit for Pediatric Therapy Partners. 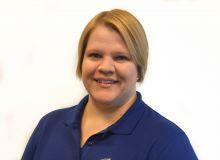 Her professional interests include sensory integration, self-regulation, and social skills. Lisa also has her Therapeutic Listening certificate.